The spark is a great forward thinking idea put forth by Arturia. 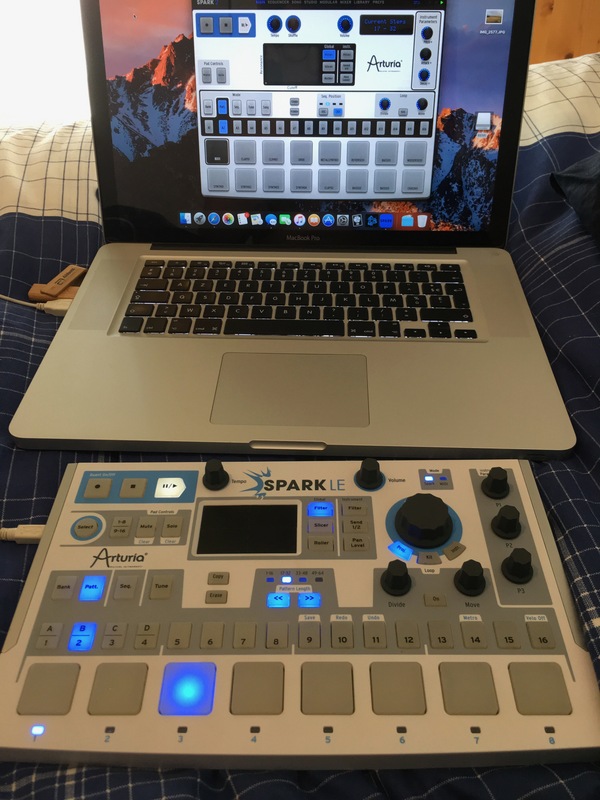 I wasn't sure what to expect considering this was Arturia's first walk in the park with a drum type machine and it was to be my first drum machine, but I have been very happy with the results. At this price point, I am very pleased with my purchase. 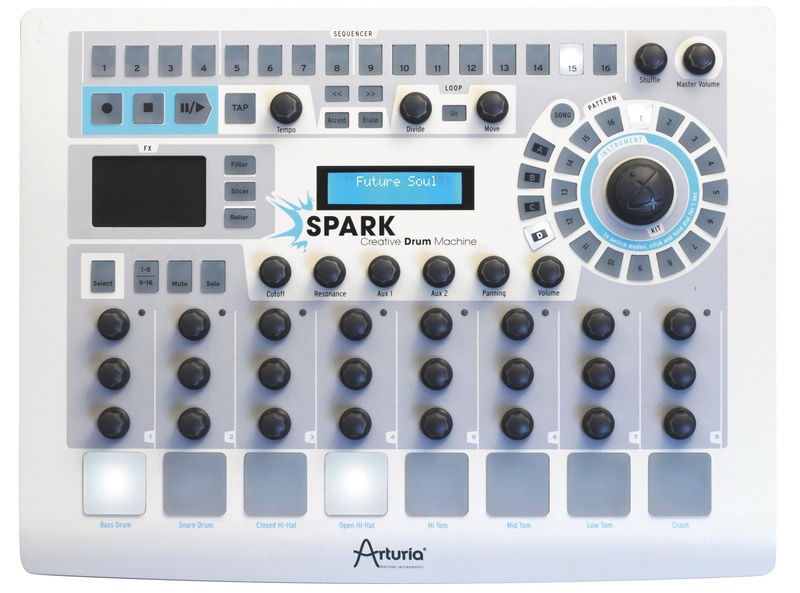 The spark boasts some big time features as well as emulations of the famed 808, 909, and more. I wasn't expecting much from the content that came with the machine, since I already have so many sample drum packs, but I was floored by the quality of the included samples. The manual was very clear and sufficient. I really didnt even need it! The quality of the samples caught me off guard. The interface looks a bit tricky and confusing at first, but within minutes I was jamming. The way everything integrates is very easy to understand which was a concern of mine. Spark is a unique instrument and approach to building drums but it is also a very straight forward and easy to understand instrument. Basically, you can create up to 16 tracks, each with up to 64 steps. These tracks are numbered 1-16 and placed in a circle. Overall, I can sit and play with Spark for hours and have so much fun. Bringing back the tactile feel of a drum machine that’s been missing from my arsenal for so long, but adding features that are very cleverly thought out and making them easy to get to. Spark ships with a great array of sounds and as I mentioned, it’s easy to change banks or individual sounds within a bank and add your own sounds. 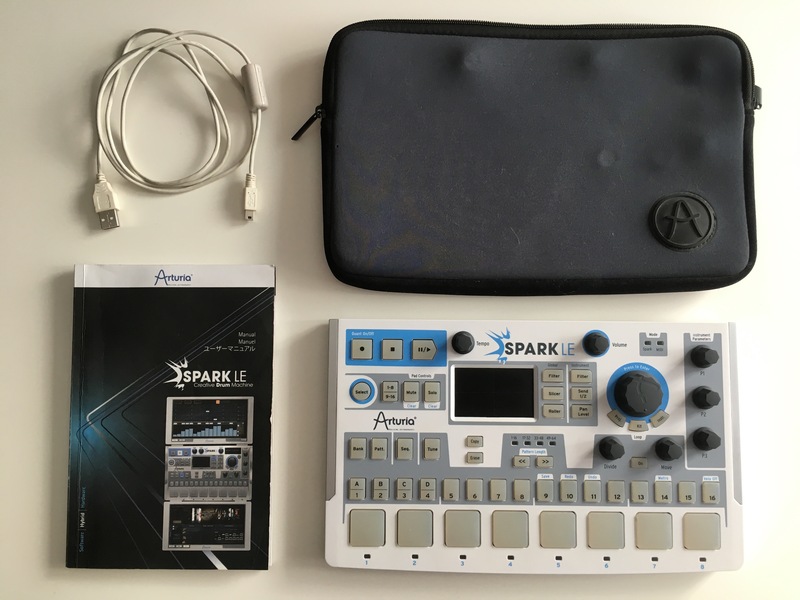 Probably the most amazing thing about Spark is the price. I had to look a couple of times to realize that at $599 retail, the hardware controller comes with Spark. How Arturia does this with such a great piece of hardware is nothing short of incredible. James...'s review"One of my favorite drum machines"
Totally independant unit. Tons of drum sounds. This unit is very much its own thing. I'm not sure I can compare it to any other drum machine. The capability is well on par with the price point. The stock content is actually very good. 808 drums. 30 kits. I could talk about this thing all day but I won't get too deep into the features yet. The interface is a bit tricky at first. I would describe it as slightly futuristic. But after you get the swing of things and maybe read the manual it becomes quite easy to use. It runs like a mixing board almost. You can run 16 tracks with 64 steps. You select the tracks via the circular dial. It's quite a unique system. Each track has a preset loaded from your bank. You have a number of onboard effects to pick from and they are surprisingly really good, just like the samples. Using it like this it's not too complicated but be warned that's just the surface. You can get very deep with the Spark. Personally I never get too crazy with it as I basically stick to some classic sounds. I use the effects sparingly but not because they are bad at all. The sounds are kind of a vintage meets modern style. The 808's are of course more in line with newer stuff, while the linndrum sounds do the 80's thing. Honestly there's just a lot of great classic sounds here and no matter what your style of music you can probably find your kit. I use them all at one time or the other. It definitely does lean more toward the vintage sounds though. It's not quite a hip hop sounding unit at its core. The effects are good, although you need to have experience dialing them in. I really like the unique interface. It's what originally drew me to the unit. This was actually my first drum machine so at the time I didn't realize how weird this thing was. My initial concern was the kits quality but admittedly these are some of the best kits out there even in the computer realm. Especially the linndrum and the 808 stuff. I think the value is amazing considering the quality you get here. Highly recommended unit especially if you do vintage stuff. 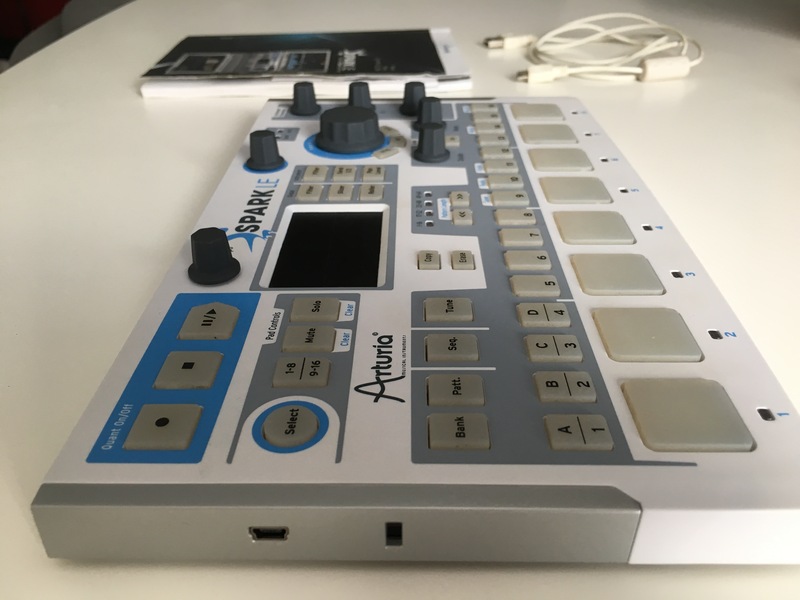 cess01's review (This content has been automatically translated from French)" Huge"
- FX Pad with Repeat, Tape, Reverse, Strobe, Pan, Mix, 3 Filter and Roller mode. - Loop mode with advanced features "divide" and "move"
Getting very quick hands, very simple and intuitive basic operation everything in the manual is very well explained! very clean and crisp sound effect of a gogo I did not use too the original sounds at first because I just found them very clear! battery levels I've ever used a drum machine with as much sin that emulates both box that sounds real! 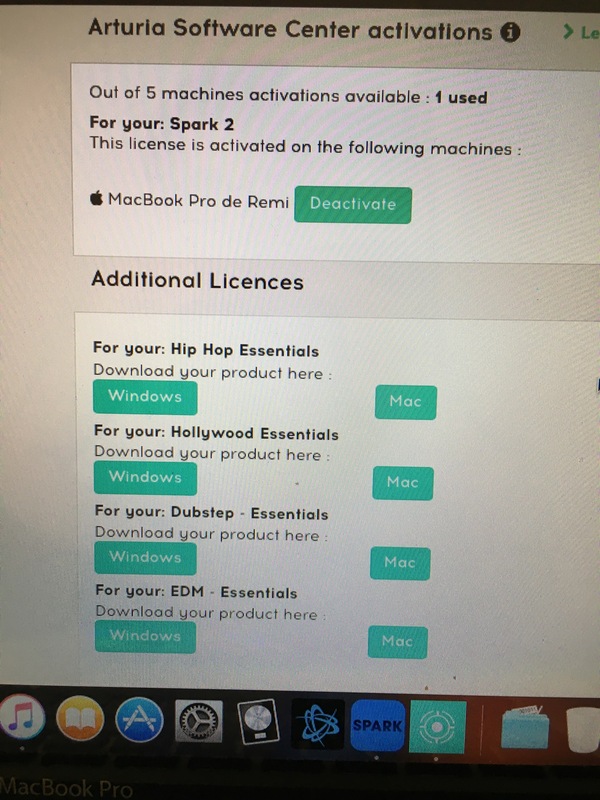 but finally c when pushing a can have later in the edition of sounds (internal or import) and its effect becomes very interresting c the spark that releases all its power and frankly it serious potato! I thought up may not be able to make wobble bass with this machine we call "creative DRUM machine" made in I use it rained and rained I realize that there really is a lot of possibility and diversity at both levels of the sounds of use of spark course must triturated every knob (for those who love !!! I did dub / dubstep coupled with a emx my and my b virus while its in sync via Abelton! and works nikel! I think NI machine sounds only concurant me and frankly not interested in it! What thing do you like most? the made that there is no limit in the edition and creation with the spark! the seriousness of arturia in product and service c! still missing some instrument or fx various well that I would see in it like: trumpet guitar ... but I trusted has arturia who knows we proposed varied pack !!! justbecause's review (This content has been automatically translated from French)" c_est the ball but ...."
only 16 sounds per kit available! 1 to 8 and 9 to 16! Why so few? at least 4 times as would have been better! if 48 Pattern in the hands, that 'the ball! Daily! The manual is not necessary so the machine makes sense! C # is the ball but I repeat myself! Damn ca is the big default !!!! 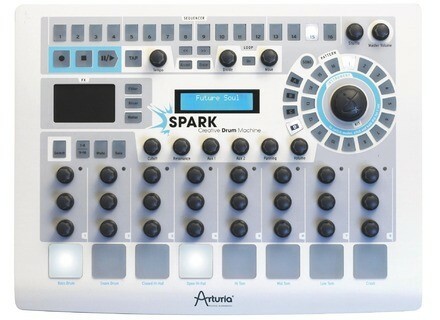 Arturia released today the second version of the Spark drum software, an update that had been unveiled in NAMM last January.